Get rid of nasty odors and make your home smell fresh at the same time. 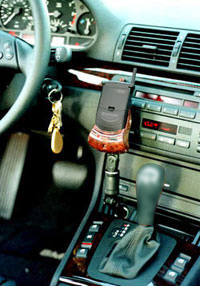 Check out our line of air fresheners. Choose from a variety of products that enhance or beautify. Check out our fantastic board games. There's something here for every person in your family. The DAYTONA CHALLENGE� Collectable board games! The ONLY board game on the market that offers realistic NASCAR� racing at DAYTONA! A Multiple player (10 or more) NASCAR� racing game with all the THRILLS, EXCITEMENT, DRAMA and COMPETITION of Restrictor Plate Racing at the Legendary DAYTONA INTERNATIONAL SPEEDWAY! Ever wonder what it's like smoking a Cuban Cigar? Unless you got one illegally, you'll never know till you smoke on of these hand made masterpieces. Bargaintown USA, is proud to be associated with NICK'S Cigar Company, of Miami, who represent three generations of Cuban Cigar makers. This company is the largest U.S. based manufacturer of hand made Cigars. They have Cuban-American management and Cuban-American Tabaqueros (Rollers), and use only aged Cuban-seed tobacco's. The only difference between Nick's Cigars and those made in Cuba are where the raw materials are grown and where the Cigars are rolled. With the finest fillers, binders and wrappers meticulously grown in privately owned farms in Nicaragua, Ecuador and the Dominican Republic; we defy you to tell the difference. You don't have to believe us. A recent tasting by Cigar Insider, (from the publisher of Cigar Aficionado Magazine) established that Nick's Cigars are among the best in the world. Of the top 25 cigars selected, five of Nick's Cigars were chosen, more than any other manufacturer in the world. Most interesting is that the La Tradicion Cabinet Series Perdomo X, one of the the cigars we are offering, ranked better than four of the Cuban made cigars in the top 25. 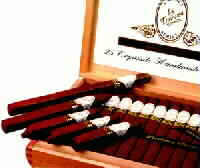 What's more, our cigars are almost half the price of the Cuban made cigars! Choose from a variety of clothing manufacturers. LRS (Lipid Recovery Serum) is a new-age skin product which can be used for the treatment of dry, or irritated skin and for the treatment of wrinkles and fine lines, particularly around the eye area. LRS lessens the appearance of wrinkles 48 hours after usage!! Overall, it improves your skin's health. Our Hand-milled soaps are Hypoallergenic and are made from the worlds most ancient oils. These soaps have a glycerin base and have Ultra Moisturizing Properties and Natural Purity. Bring back that soft skin feel you had as a teenager with Forever Eternal Face Moisturizers. Once you try this Hypoallergenic face treatment you'll never go back to any other product. Unscented Forever Eternal Face Moisturizers contain the benefits of rich Vitamin A, Vitamin C and Vitamin E, Hydroxy Lactic Acid, and the soothing effects of Aloe. Your sensitive skin will love the purity of these natural ingredients. Take your favorite beverages or sandwiches whereever you go, keeping them fresh and cool for hours! All of our products are made with durable water repellant polyester material and Space Age foam insulation for maximum temperature control. These cute and cuddly plush toys are fun for the entire family. In the BargaintownUSA tradition, they are inexpensive as well. You can find many of your favorite characters here. From Curious George to Woody Woodpecker and more. Milky Spore is a naturally occuring bacterium that affects Japanese Beetles at the grub stage of life. Milky Spore was first developed by the USDA in the 1930s to combat the Japanese Beetle but Milky Spore controls the June bug and Oriental beetles as well. These beautiful Genuine Walnut Sewing Cabinet will store all your sewing equipment in one place. These easy to open cabinet provide 5 compartments, two with covered tops and one very large area for storage. It is easy to use and move with its attached handle. Makes a great gift for anyone you know. CONCEPT:FX is perfect for film, video, multimedia, computer games, web sites, music projects, radio, or anything that calls for distinctive sound effects. It's also a great addition to every existing sound effects library. Best of all, once you buy CONCEPT:FX, the sounds are yours to use forever, royalty-free (no additional fees!!!). 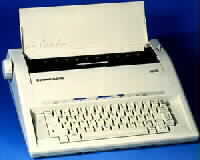 Featuring the Commodore Electric typewriter and printwheels for many types of printing devices.